Zip Strip | Pro Chem, Inc.
ZIP STRIP reduces your investment in wax removal – no machines, no stripping pads, no electricity and most importantly, less labor fatigue. The appealing fragrance is pleasant to work with due to the absence of harmful ammonia vapors. 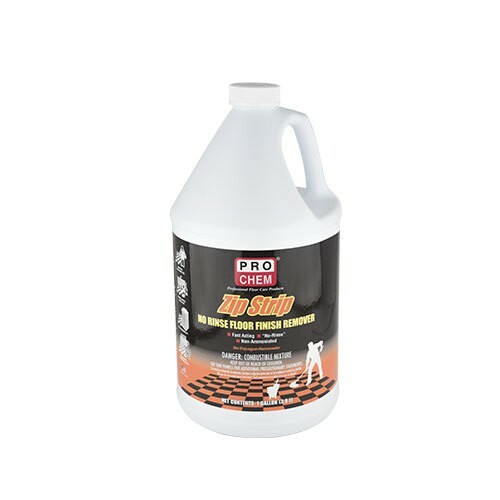 It is a premium nonammoniated stripper formulated with high concentrations of solvents and amines to penetrate quickly for fast, efficient stripping. For Moderate Accumulations: Use 1 part stripper to 4 parts hot water. For Heavy Accumulations: Use 1 part stripper to 1 part hot water. Mop floor using one of the above solutions freely. Allow to stand 5 to 10 minutes. Remove emulsified wax with a mop or wet vacuum or auto scrubber. Allow floor to dry completely before applying floor finish, as rinsing is not necessary unless powdery residue remains on the floor.